I really do like greens. It’s not a matter of tolerating them when they appear or making use of them from time to time. I really want to eat greens every day, and I can find ways to include them in just about any meal. Just ask Kurt. So, the new book from Jenn Louis, The Book of Greens: A Cook's Compendium of 40 Varieties, from Arugula to Watercress, with More Than 175 Recipes of which I received a review copy, is a delight for me. Also, Jenn Louis’s last book was about making pasta and dumplings, and some of those elements, that I happen to love creating in the kitchen, find their way here into dishes incorporating greens. This all adds us up to quite a lot that makes me very happy in this new book. Now, the only issue with greens is that the sturdy, earthy, serious greens like kale, chard, and collards thrive in cooler weather and aren’t part of our local, summer produce. But happily, this book covers the full spectrum of greens, including a few I’d never thought to bring into the kitchen before, and there are hot weather options too. The book is organized alphabetically by the name of each green, and there’s general information about each variety followed by recipes for it. Since locally-grown arugula is available almost year-round, I was happy to try the Arugula Salad with Red Grapes, Feta, and Dukkah. It comes with a suggestion for trying it with plums in place of the grapes which I did, and it was fantastic. The Dandelion Salad Sandwich is a smart combination of a sweet butternut squash puree with dressed slivers of dandelion greens and slices of hard-boiled eggs. The Miso Soup with Turmeric, Wheat Noodles, and Gai Lan would also be great with bok choy or chard in place of the gai lan, and why have I never thought of taking miso soup in a direction like this? There’s a section just for herbs, one for lettuces, and one for root, fruit, and vegetable greens. It’s a great reminder that squash leaves, sweet potato greens, and tomato leaves are edible and available in the summer. I tried the Tomato Leaf-Egg Pasta with Butter and Fresh Tomato Sauce and highly recommend it. And, while I have enjoyed nopales from cactus plants, I’ve never harvested aloe vera stalks for juicing. There’s a cocktail made with aloe juice and tequila in the book, and I can’t wait to try it. The point of the book is, of course, to highlight greens, but the recipes grab attention first for the mix of flavors and textures. They just happen to be made with all sorts of different leaves. When I read about the Mustard Greens Pancakes, I marked the page immediately. These were made with baby mustard greens that I was able to get at Boggy Creek Farm. 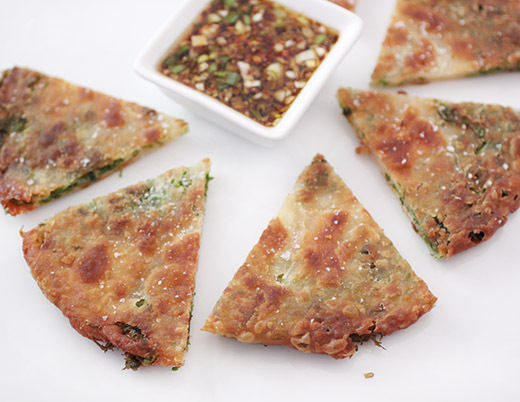 They’re like scallion pancakes, and I’ve made a similar flatbread before. 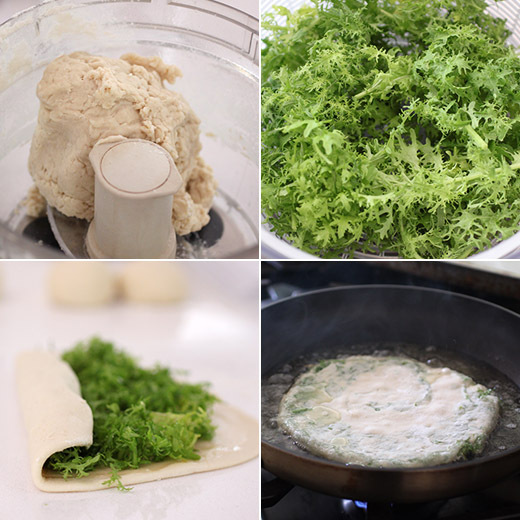 But here, the dough is layered with fresh, chopped greens before completing each pancake. It’s a fun process. A simple dough of flour and boiling water was made in the food processor. After it was kneaded and allowed to rest, it was divided into four pieces. Each piece was rolled into a disk, brushed with sesame oil, the disk was rolled up into a cylinder, the cylinder was then coiled like a snail, and then rolled into a disk again. The second time, that dish was brushed with sesame oil, topped with sliced mustard greens, and the cylinder and coil rolling was repeated before flattening the dough into a final disk shape. The pancakes were cooked in untoasted sesame oil for a few minutes per side until golden. A dipping sauce was made with soy sauce, rice vinegar, sesame oil, green onion, and ginger. The crisp pancakes were cut into wedges to be dipped into the sauce. These pancakes are easy to like with their crispiness after being cooked in oil. More traditionally, they would be made with scallions layered into them rather than mustard greens, but I loved this take on the concept. Here and with most of the recipes in the book, the type of greens used can easily be changed without any problem. Just choose some greens, any greens, and this book will give you great inspiration for using them. Reprinted with permission from The Book of Greens: A Cook's Compendium of 40 Varieties, from Arugula to Watercress, with More Than 175 Recipes by Jenn Louis, copyright © 2017. Photography by Ed Anderson. Published by Ten Speed Press, an imprint of Penguin Random House LLC. 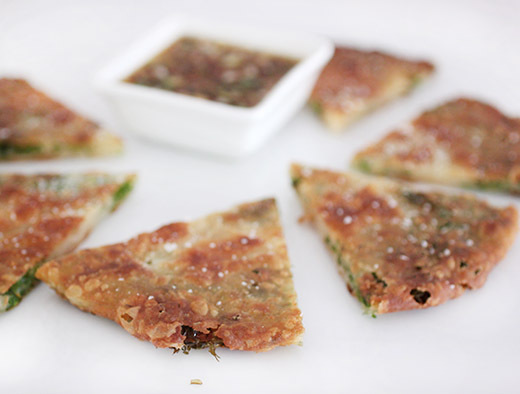 These aren’t like breakfast pancakes; they are like the scallion pancakes you might find in a Chinese restaurant. If you love the sharp, strong flavor of mustard, then you will love these. Or if you don’t want so much of a vegetal flavor, consider subbing in a milder green, such as spinach or chard. The dipping sauce drives home the Asian flavor. Put the flour in a food processor. With the motor running, slowly drizzle in 3/4 cup of the boiling water. Process for 15 seconds. If dough does not come together, drizzle in more water, 1 tablespoon at a time, until it just comes together. Transfer to a work surface and knead a few times to form a smooth ball. Cover with plastic wrap and allow to rest for 30 minutes at room temperature. Divide the dough into four even pieces and roll each into a smooth ball. Working one ball at a time, roll out into a disk, about 8 inches [20 cm] in diameter. Using a pastry brush, paint a very thin layer of sesame oil over the top of the disk. Roll the disk up like a cylinder, then start at the end and coil the dough like a snail’s shell. Flatten gently with your hand and roll again into an 8-inch [30-cm] disk. Paint with another layer of sesame oil, lay an even layer of one-quarter of the sliced mustard greens, and roll up like a cylinder again. Again, coil like a snail shell, flatten gently, and re-roll into a 7-inch disk. Repeat with the remaining dough and mustard greens to make three more pancakes. Combine all the dipping sauce ingredients and set aside at room temperature. To cook the pancakes, heat the oil in an 8-inch (20-cm) nonstick or cast-iron pan over medium- high heat. When the oil is hot, after 2 to 3 minutes, carefully slip one pancake into the hot oil. Cook, shaking the pan gently until the first side is an even golden brown, about 2 minutes. Carefully flip with a spatula or tongs and continue to cook until the second side is and even golden brown, about 2 more minutes. Season with salt, cut into 6 wedges. Serve immediately with the sauce for dipping. Repeat with the remaining pancakes. Fantastic! I'd love to taste them. I too adore greens! Those mustard greens are very different from mustard greens I knew as a kid. Yours looks more like salad greens. They're baby, frilly mustard. They are great in salads too, but they're sturdy enough to take some heat of cooking. Love them! I've heard about this new cookbook and wondered if the recipes were something we might like to keep in regular meal rotation. The review will have me delving deeper into this intriguing book on greens! The pancakes are a delight! i've definitely never eaten greens in something like this but how appealing! tasty sauce too! Lisa absolutely love this recipe ! look amazing ! This sounds so good! And I have some mustard greens to use up in the fridge! Love greens, In fact tonight's dinner is greens sauted with onion and garlic, loads of red pepper flakes. and white beans. Anyway, love greens in pancakes -- so good! This looks terrific -- thanks.